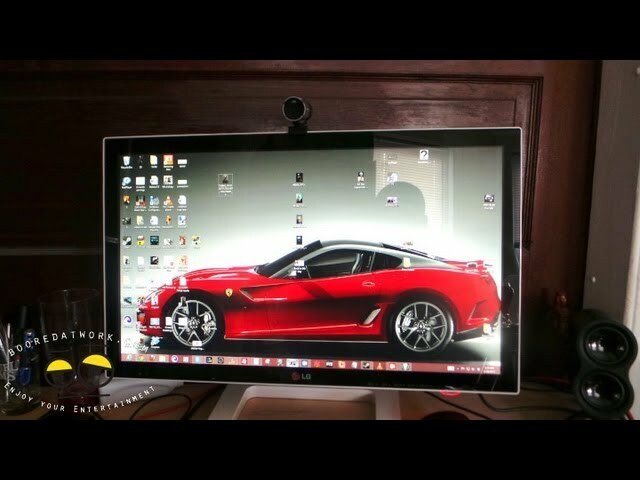 http://booredatwork.com/lg-et83-23-inch-ips-led-10-point-touchscreen-monitor-unboxing/Twitter: http://twitter.com/booredatworkTwitter- http://twitter.com/Say2wordsTwitter- http://twitter.com/booredfemmeFacebook: http://www.facebook.com/pages/Booredatwork/211909969459Google+: https://plus.google.com/b/107460054073872296956Empireavenue: http://www.empireavenue.com/booredPinterest- http://pinterest.com/booredatwork/LG Touch10 monitors provide new screens that can track up and respond to 10 simultaneous points allowing various multi-finger gestures.As LG IPS Monitor features consistency and less changes in color temperature, it offers a colour impression identical to that of the original image. LG IPS Monitor allows you to enjoy lifelike picture quality without any color shift whether you are standing or lying down. LG IPS Monitor always provides clear images with smooth color changes. It allows you to enjoy any content, such as action movies, web surfing and RPG games for a long time in comfort. FULL HD resolution brings you magnificent picture quality through outstanding colour accuracy, visual contrast and sharpness. LG's Mega Contrast Ratio technology delivers outstanding contrast ratio that enhances picture brightness and clarity.LG's unique monitor is also ideal for educational applications as its advanced touch functionality creates a fun and easy way for students to control the latest learning software. The vivid IPS display provides a wide horizontal viewing angle that is perfect for large groups to view the screen.In addition, setting up the monitor is easy. Full touch interaction is available as soon as the monitor is connected, with no extra software installation required. A range of touch-friendly apps are currently available from the Windows Store, offering consumers a fun and entertaining experienceThe Touch 10 monitor will be available in Korea next month followed by markets in Europe and elsewhere.